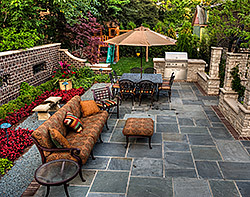 We at Outdoor Escapes are experts in creating unique outdoor living areas that will effectively expand your property’s livable space. Whether you own a business establishment or a typical residential property, we can nevertheless design and create the perfect outdoor living area and other recreation spots that you need. Extended living space. The trend nowadays is to effectively enlarge one’s indoor area by developing outdoor spots. This is one excellent way of maximizing lot space. Improved comfort and functionalities. If you frequently entertain visitors, adding outdoor living areas will let you accommodate them outdoors. An outdoor kitchen, for example, will allow you to serve your visitors food al fresco style without having to hurry back and from your home. Staying outdoors will also become more comfortable and fun on your part since you can sit back and relax on your cabana or gazebo. Added appeal and market value. Properties with developed outdoor areas are known to be priced much higher than those with undeveloped outdoors. Aside from the monetary consideration, developing your outdoors will also enhance its look several times over. Outdoor kitchen. Serve sumptuous meals to your family and guests right in your own yard. 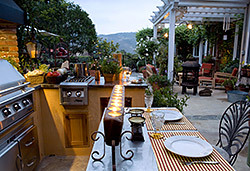 We can create themed outdoor kitchens with all the cooking amenities that you need. Patios. Entertain guests over a cup of coffee or tea or just spend quiet time alone after a tiring day’s work. 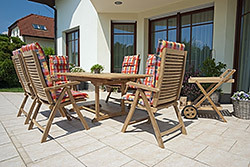 A nicely designed patio can give you a relaxing experience while making your yard more attractive. Decks. A deck can be built on ground level or on a raised platform, depending on your preference. Pergolas. Your garden or walkway will be more enticing and appealing with a great-looking pergola. Gazebos. Gazebos are perfect rest and recreation spots in any Missouri property. With the different designs available, they can definitely make your outdoors a knock-out. Pool decks. A pool deck adds beauty to any pool area. Whether it’s made of concrete or stone pavers, rest assured that we will make it serve its purpose well. Cabanas. Cabanas are normally placed around pool areas but they can also be positioned in gardens and other strategic spots within your property. Sitting areas. Tired of walking around your property? A sitting wall is all that you need. Our focus is to build the best outdoor amenities for our valued clients. We aim to improve the functionality of their outdoors through the outdoor living areas that we create. Being experienced contractors, we can work on small spaces, on large properties, and even commercial ones. We are improving the lives of our Missouri and Kansas clients by building them functional and beautiful outdoor living areas, with emphasis on beauty and durability. Each of our creation is guaranteed to meet and even exceed industry specifications. For truly exceptional outdoor living amenities, call Outdoor Escapes today.